There is a slowing of production and dwindling of reserves at many of the world's largest mines. All the oz's or pounds are never recovered from a mine - they simply becomes too expensive to recover. The pace of new elephant-sized discoveries has decreased in the mining industry. Discoveries are smaller and in less accessible regions. 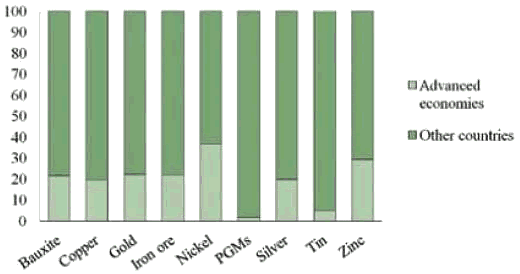 Mineralogy & metallurgy is more complicated making extraction of metals from the mined ore increasingly more complex and expensive. Mining is cyclical which makes mining companies reluctant to spend on exploration and development. There is no substitute for many metals except other metals - plastic piping is one exception. Metal markets are small so speculation is a larger factor. There hasn't been a new technology shift in mining for decades - heap leach and open pit mining come to mind but they are both decades old innovation. Country risk - resource extraction companies, because the number of discoveries was falling and existing deposits were being quickly depleted, have had to diversify away from the traditional geo-politically safe producing countries. The move out of these "safe haven" countries has exposed investors to a lot of additional risk. Lack of recognition for population growth, growing middle class w/disposable incomes and urbanization as on-going demand growth factors. Increasingly we will see falling average grades being mined, mines becoming deeper, more remote and come with increased political risk. Fact; The world's resources are finite. Fact; Supply is constrained and demand keeps growing along with the world's population. Fact; A sustainable and secure supply of raw materials and energy is becoming the number one priority for all countries. Major powers are scrambling for as much of the world's resources as they can control. Exploration and drilling intensify daily. Previously inaccessible or unprofitable areas are targeted - the days of easy access to the globe's resources no longer exist. Unseen wars in previously unheard of places - soon to become front page news - are beginning for resource control. Peace today, harmonious relations tomorrow are nothing but fleeting illusions. Hydrocarbons, mineral resources, fresh water and arable land are finite. Understand someday peak oil and gas proponents will be proven right. Understand arable, productive farmland is disappearing from overuse, desertification and urbanization. Understand the world's current population of 7 billion people use 60 percent of our annual renewable freshwater supply. The world's population is projected to hit 10 billion by 2050 - global demand for food and water is expected to increase by 50% and 30% respectively by 2030. This is our reality - we're living on a relatively small planet with a finite amount of reserves and a growing human population. Broad spectrum peak commodities is a cause for concern, for all of us, over the short, medium and longer term. Try and imagine the coming pressure on governments in regards to sourcing resources on a national scale. Conflicts are inevitable. One country seems to have recognized its need for security of supply and is actively securing said resources for itself. One country is staking claims, through aggressive diplomacy, wherever vital reserves of resources can be found. China is now the world's largest trading country, it has the second-largest economy and the largest economy in terms of purchasing power parity. In October 2015 China's leaders outlined the country's 13th five-year plan (running from 2016 - 2020). Their goal is to continue efforts overhauling China's investment-led economy into one driven by services and consumption. China's stated 2020 GDP goal requires adding an economy the size of Switzerland's every year. "By building much-needed infrastructure across the Silk Road routes - from roads and rail links to ports and resource pipelines - China hopes to build "a community of common interest, destiny and responsibility." No country is better suited than China to lead the way on infrastructure. Because its own development has been propelled partly by massive investments in domestic infrastructure projects, China has plenty of recent experience in the field, not to mention a vast construction materials industry. Moreover, its huge volume of foreign reserves - which stand at some $3.5 trillion and are likely to continue growing - provides the wherewithal to fund the projects. China has already devoted some of its reserves to capitalising the recently established Asian Infrastructure Investment Bank (AIIB) - an initiative that China spearheaded to support its Silk Road ambitions. With the participation of 57 countries from five continents - including some of America's closest allies, such as the UK, France, and Germany, which joined over US protests - the AIIB is the first initiative designed specifically to fulfil infrastructure needs in the developing world, and especially the Asia-Pacific region. 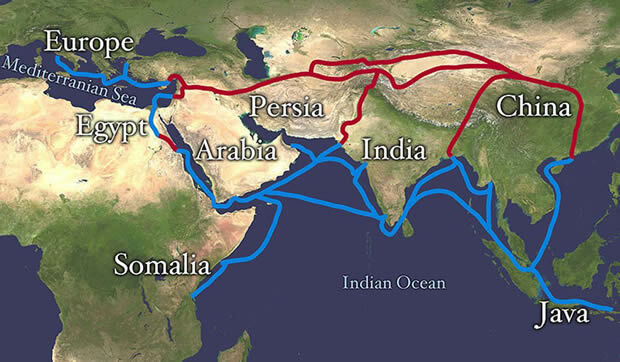 The Silk Routes, collectively known as the "Silk Road", referred to a 7,000 mile network of interlinking trade routes that were used for three millennia. They connected China, India, Tibet, the Persian Empire, the Mediterranean countries and parts of North and East Africa. President Xi Jinping launched China's "One Belt, One Road" (OBOR) initiative in 2013. The stated aim was to connect major Eurasian economies through infrastructure, trade and investment. The "Belt" refers to a network of overland road and rail routes and oil and NG pipelines planned to run along the major Eurasian Land Bridges - China-Mongolia-Russia, China-Central and West Asia, China-Indochina Peninsula, China-Pakistan, Bangladesh-China-India-Myanmar. They'll stretch from Xi'an in central China through Central Asia reaching as far as Moscow, Rotterdam, and Venice. An article published by the New York times 'The World According to China' by Gregor Aisch, Josh Keller and K.K.Rebecca Lai says China has displaced the United States and Europe as the leading financial power in large parts of the developing world. 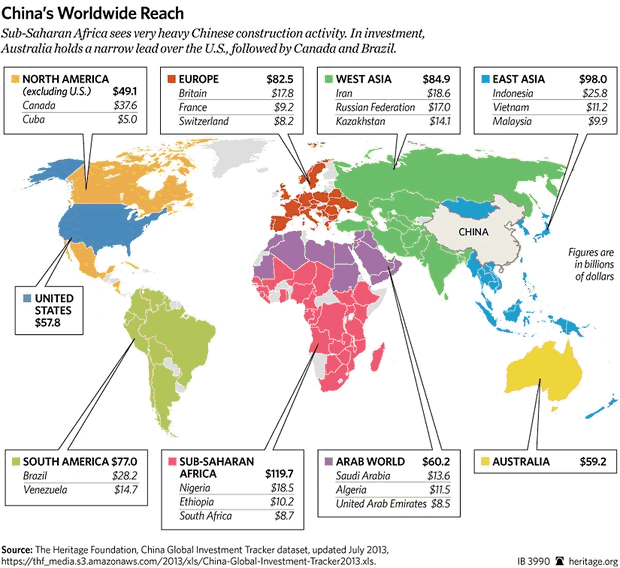 Here's where China has the most influence , based on its share of foreign investment since 2005. "Living in the United States, the scale of foreign investment by Chinese companies isn't so obvious. Much of the $57.8 billion of Chinese investment in the U.S. since 2005 has been in the finance sector. I didn't comprehend the scale of the Chinese investment until I visited Ethiopia earlier this month where nearly all the construction projects -- including a major light rail line -- were being done by Chinese firms (sub-Saharan Africa has the most investment from China of any region). Many huge factories on the outskirts of the capital city are joint projects between China and Ethiopia with the flags of both countries flying side-by-side. The redevelopment of a major road was paid for by Chinese government and is now dubbed "Ethio-China Friendship Avenue." In other words, the scale of Chinese investment is overtly apparent in Ethiopia and many other countries around the world, if not as obvious in the developed world." In a recent article 'Chinese investment along One Belt One Road Revealed' Finbarr Bermingham discusses Chinese investment along the new Silk Road. "The One Belt One Road (OBOR) initiative is the single most ambitious infrastructure plan in the world today, and data seen by GTR shows that over the third quarter of 2015, the vast proportion of China's governmental loans were disbursed along the route." "By the looks of things, investment along this "highway of the future" will be a major trend in mining and exploration over the next decade." The First Industrial Revolution started with technological innovation driving the slow industrialization of the United Kingdom in the 18th century which merged into the Second Industrial Revolution around 1850. The start of the second industrial revolution was marked by a transition of technological leadership from Britain to the United States and Germany. What is happening today is not being driven by technological innovation or technological leadership, what's driving China's economy today is urbanization, population growth and consumerism. A global shift in trade with China by far the biggest beneficiary. The exporting of Chinese current industrial/consumer overcapacity to trading partners along 'old is new again' trading routes. All road, rail and shipping lines leading back to China with much of the world's resources on it to build more industrial and consumer oriented manufacturing. China becomes the hub, no let's change that from CHINA BECOMES, to CHINA IS, FOR MOST OF THE WORLD, it's industrial/consumer manufacturing center. This will be accomplished by using vast amounts of the world's resources, that China controls through infrastructure lending and off-take agreements for resources. The capture of the world's resources by China, the country's aspirations to become the world's leading manufacturer and exporter of finished goods, should be on all our radar screens. This fascinating process, being played out on the world's stage, is on my radar screen.